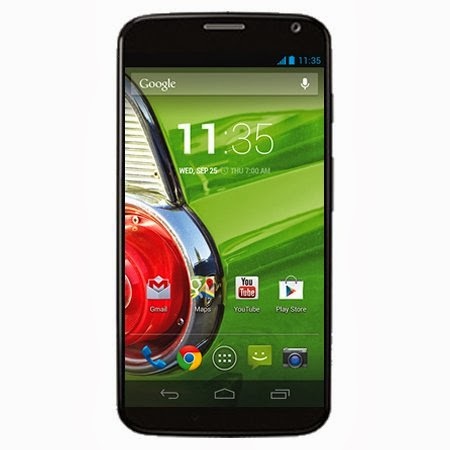 This week's Deal of the Week pick is the manufacturer refurbished Verizon Motorola Moto X 16GB XT1060 (1st gen) LTE Android phone for $109.99 from eBay seller bidallies (98.4% positive feedback). This is the 1st gen Moto X that originally sold for $499.99. It has a dual core 1.7 Ghz processor, 2 GB of RAM, a 4.7" 720x1280px screen, 10 MP autofocus main camera with flash and a 2MP front camera. It features Active Display, which lights up the screen when you pick it up to show your missed calls, texts and upcoming calendar events on the lock screen. The Moto X runs Android KitKat with an upgrade to Lollipop expected soon. It works on Verizon Prepaid as well as Verizon MVNOs Page Plus, Selectel, Puppy Wireless, TracFone, NET10 and Straight Talk. It's also an unlocked GSM phone that supports UMTS on the 850, 900, 1900 and 2100 Mhz bands and LTE bands 4 and 13 so it will get 3G and HSPA+ 4G pretty much anywhere in the world. It will also work on the T-Mobile and AT&T networks although not optimally as it's missing T-Mobile's 1700 3G band and all of AT&T's LTE bands except band 4. Verizon (or PagePlus) Motorola Moto G (1st gen) Android phone (manufacturer refurbished) $49.99 Free shipping. Verizon (or PagePlus) Motorola Moto X 16GB XT1060 (1st gen) LTE Android phone (manufacturer refurbished) $129.99 Free shipping. Includes free one year subscription to Microsoft Office 360 (redeem by 7/31). Updated 7/2 New Walmart deal. Moto x vs. LG g2? That depends on your budget and whether you prefer a smaller phone. They are both good. The G2 wins on specs: more internal memory, better camera, larger, higher resolution screen. The Moto X is smaller, easier to use one handed, feels more rugged and is closer to stock Android. For me, the deal breaker is "more internal memory". From miserable experience, I had a terrible time with phones with not enough internal memory: spending so much time removing and re-installing and removing apps. The more the better. I am not going back. It's all the more important now with the change in Android KitKat and later, which makes it hard to work with a MicroSD card for additional memory (this requires rooting to make it work properly). Go with the thoroughbred, I say. The G2 seems to be it in this comparo. Larger phones are easier to type on and see, too. "eBay Now is a local delivery service powered by Shutl Inc. Shutl's network of valets will deliver your items from your local Best Buy at a time that is convenient for you." It appears to be a local delivery service. "Ebay Now" Nothing different about the ebay purchase process, just the backend of how it gets on your doorstep. Yeah. you have to work real hard at being terrible to customers in order to get an 82% rating. It'd be a crap shoot getting anything good out of them.... make sure there's some money-back eBay protection. The MX has an amoled screen...more visibility outdoors. The G2 has better specs. And is equally as durable with the Tech21 case. A generous guess, Zach, would be that this change means that it is not an "option" any more, because it is built into your plan, and allowed as per the Network Neutrality ruling. Anonymous. My plan usage still states 100 MB tethering limit. I thought that too but that the $30 wasn't included as others have indicated. Who knows, T-Mobile likes to confuse people. I was wondering if any of the Boost dealers mentioned in this article are able to offer the half price plans to Cricket and Metropcs customers? There are very few local Boost dealers in my area. Must I port from Cricket to get the 10 Gb plan or could I port from Metropcs but choose the Cricket plan, ? No, you have to go to a Boost store to get the half price promo. It's not available from national retailers like BestBuy, Target or Walmart or online phone-only vendors like Amazon or ShopCellDeals. As far as I know dealers should be able to activate a new customer on any of the half price plans as long as they are coming from Cricket or MetroPCS. Call the few Boost dealers in your area to confirm. will anyone price match the Target in store specials? I don't have a target within an hr of me. Walmart and Bestbuy price match but you wont have proof of an in store special. Thanks Dennis for the Boost info. They want to see the price in a Target ad. You can try taking a picture of the shelf tag and asking W or BB to call and verify, but they probably won't. Does anyone know which Boost phones support spark? I'm not clear about Byod on Boost. For example, could I buy a new Sprint LG G2 and use it on Boost? Check the phone's specs on Phone Scoop. To be Spark compatible a phone needs to support LTE bands 25, 26 and 41. The Sprint LG G2 is Spark compatible and can be activated on Boost. Is the Cricket Moto E at Walmart the 2nd version like the one Carried in corporate stores? Does Walmart charge an activation fee like Cricket stores? Thank you. It's the 1st generation non-LTE version of the Moto E. There's no charge for activating Cricket phones purchased from Walmart it you do the activation online. Dennis, regarding the Moto X you say: "It will also work on the T-Mobile ... network although not optimally as it's missing T-Mobile's 1700 3G band." "T-Mobile USA is shutting down its HSPA network on the AWS band in 24 markets this year. Technically the shutdown is of UMTS, which includes HSPA and HSPA+, which are the 3G and pre-LTE 4G standards for GSM networks. The AWS band, which is also called the 1700 Mhz band, 1700/2100 or band 4 is where T-Mobile first deployed 3G HSPA in 2008." 1700 3G is still relevant to T-Mobile users unless they use their phone exclusively in the markets where 1700 is LTE only. That's only 3 markets so far and 24 by year end. The Verizon Moto X also doesn't support T-Mobile's LTE bands 2 amd 12. It does support LTE on band 4 which is T-Mobile's main LTE band but a phone that supports all of T-Mobile's bands would better choice for T-Mobile. Cricket will now be sold in Meijers including sim cards. Meijers has 213 super centers like super Walmart in 5 states. It would be great if Meijers could be included in the weekly deals list. Meijers is much bigger than Frys, HSN, Qvc, Newegg, Expansys etc. They carry a wide selection of prepaid brands but no contract phones. I would if I could find Meijer's current prepaid phones on sale. There are none in their weekly adMeijer Weekly Ads and the "Cell Phones" category on Meijer.com has only accessories, no phones. Dennis, the Target code numbers are actually called "DPCI", not "DCPI". The price of the Verizon Moto G has dropped to $19.99 at both Best Buy and Walmart. Can the Verizon Moto G be used on Verizon MVNOs or flashed to Sprint MVNOs? Will it function without activation like a kid sized tablet? The Verizon Moto G can be used on Verizon MVNOs after 6 months paid service on Verizon Prepaid. It will not work on Sprint MVNOs. It will work as a WiFi tablet without being activated. The Ptel 2nd month of service free with port promotion now works with the new $30 plan, saving you $5, with or without the free phone promotion. LG G2, Sprint at Best Buy in black or white for $149.99. A true Phone Phreak found the AT&T GOPHONE Microsoft Lumia 640 at Meijers stores on sale for $24.99 right now !! !